A straightforward visual image bonded to a simple declarative statement and - presto! - more Skrlin cartoon magic. With the magic of the cartoon smashing the mirrors and blowing away the smoke of the city hall magic show. This time the subject is the 2013 audit of city finances conducted by the New York State Comptroller. That audit exposed a laundry list of budgetary foolishness, but the audit also discovered that taxpayer dollars had been mishandled within the budget and that - drumroll - some taxpayer cash remained unaccounted for at the close of the audit. How much was unaccounted for? The auditors estimated that "conservatively estimated, $1 million to $1.4 million" remained unaccounted for. Hmm. Even more puzzling than the missing money is the complete lack of interest the Dyster administration has in finding it. The cartoon is double edged as it poses the possibility of monkey business referring obliquely to the famous "Infinite Monkey Theorem." In this version of the theorem a half dozen primates working overtime were unable to locate the mislaid taxpayer cash. 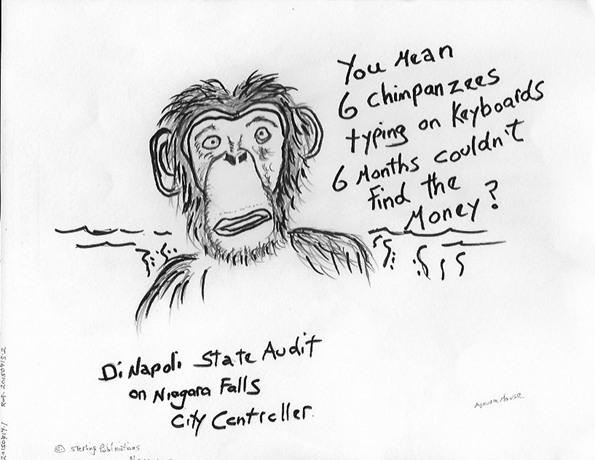 As it happens to be, a half dozen of the State Comptroller's top auditors were unable to locate the funds over the course of their six month audit. The financial condition of the city is tragic but this cartoon makes one laugh, ergo the reality of the human condition: tragedy made survivable through humor.